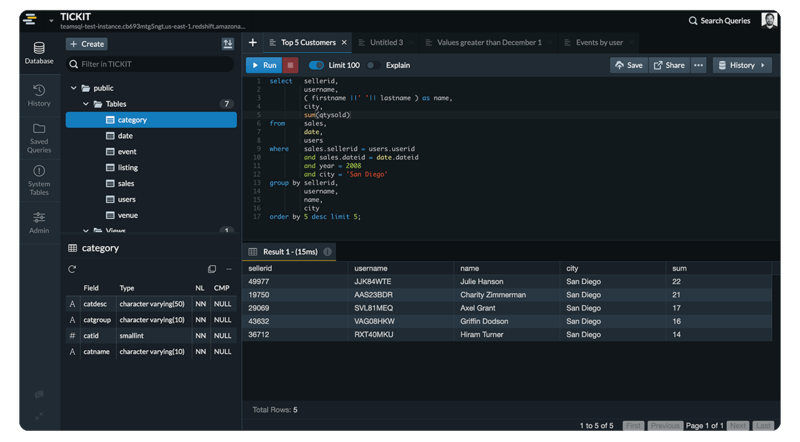 When you're working in a TeamSQL query editor window, you'll find a list of queries that you've run using that window in a sidebar located to the right-hand side. Not only can you review the work you've done, you can easily reuse the code. Simple click on any of the snippets available and TeamSQL will automatically populate your query with the code you've chosen. Our searches are powered by Elasticsearch, so you can be assured of finding what you need when you need it. In the History tab, you'll have access to the Global SQL Execution History. This works like your local query history; you'll have access to the full code you wrote, regardless of whether you wrote it for Oracle, MySQL, Microsoft SQL Server, PostgreSQL, AWS Redshift, Redis, Amazon Aurora, MariaDB or CitusData (though you get visual indicators of which query belongs to which database engine, of course)." Furthermore, TeamSQL caches the results returned by your queries on your local machine, so you can go back in time with rerunning the queries themselves. We do not store the results of your queries anywhere else.